"A very light and airy low carb treat that satisfies any sweet tooth. You are able to change the flavor to suit your taste. The secret is sugar-free gelatin! This is an easy recipe and they bake up beautiful every time. My son enjoys strawberry. He says they taste like cotton candy!" Preheat oven to 250 degrees F (120 degrees C). Line 2 baking sheets with parchment paper. Cut about 1/4 inch off a corner of a heavy gallon-size resealable plastic bag, and push a large-size cake decorating tip (such as a star tip) into the opening. The fit should be tight. 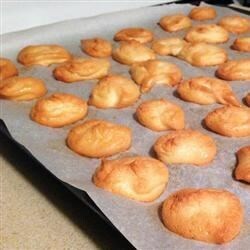 Squeeze the bag to place golf-ball size dollops of meringue mixture onto the prepared baking sheets. For a decorative effect, twist and lift as you place the cookie on the sheet, to make a pretty shape. Bake in the preheated oven until the cookies are set and dry, about 1 hour and 30 minutes. Do not open oven door while baking. At end of baking time, turn off oven, open oven door, and allow the cookies to slowly cool in the oven before removing from baking sheets. Store in airtight container.